Transmisogyny--transphobia directed specifically and often exclusively at trans women--has felt continually rampant in many of my communities for an entire decade now. I frequently witness transphobia against trans women expressed by people who do not similarly target trans men, thus rendering this particular expression of transphobia sexist in a somewhat traditional sense. I witness transmisogyny practiced most often by cisgendered (i.e. 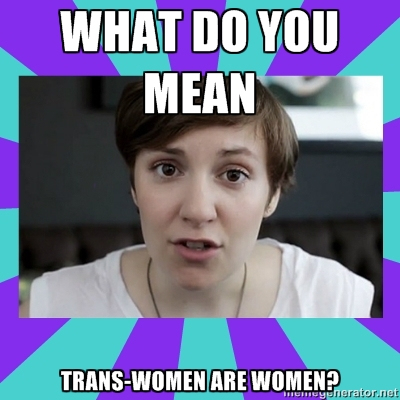 non-trans, female-assigned at birth) women. I see transmisogyny excused most often by other cis women or other folks who were female-assigned at birth, including trans men, genderqueers, and gender non-conforming women. As a genderqueer butch, female-assigned at birth person of color, transmisogyny personally upsets me most when practiced by women and gender non-conforming people of color; especially when their transmisogyny ends up being directed explicitly at trans women of color; and most of all when said transmisogyny is practiced by individuals and groups who possess and articulate clear analyses of how feminist and women's movements have frequently marginalized certain classes of women, including women of color, queer women, and gender non-conforming folks who were female-assigned at birth. And I dare say that I see folks who claim to be allies to trans women, people of color and white folks alike, excusing or explaining away transmisogyny committed by cis women way more often than those same people would ever excuse acts of racism, sexism, or even transphobia against trans men or gender non-conforming folks who are female-assigned at birth. These are simply my observations, from my particular perspective, with all of my privileges and lacks thereof. What do you think? What have you seen or experienced? Editorial note: Facebook comments and shares are nice, but comments and discussion here are even nicer! That way folks who aren't on Facebook can both read and participate. Yeah, while I won't go too in depth about my personal life- I have experienced transmisogyny at the hands of other women. Namely, lesbian identified women of color. As a transwoman of color- it broke my heart and took me a VERY long time to get over their ignorance. What was said/done to me is indicative of many cisgendered peoples' ideas on transwomen. Though for some us, being trans, out and proud is important- a lot of people still see us simply as men. And, us transwomen who have the ability to be "stealth" (a false privilege) are often times accused of trickery and insincerity when not divulging trans status to all of our colleagues. As women, it's imperative that us transWOMEN are accepted and thought of as women by cisgender women. A serious movement needs to happen in my eyes that can facilitate this much needed alliance between all kinds of women. Divided we fall! I suppose it's my old-fashioned upbringing in Texas, but I always felt a lady is a lady and it wasn't my business to decide whether she what kind of lady she was; it was my job to be a southern gentleman butch and treat her as a one. I have been thunderstruck by the venom directed at trans women by otherwise so politically correct gay folk. I realize this is an older article, and so Trey will likely not see this. But if you do, know that you brought a tear to my eye, and I have an urge to hug you.